Over on the forums, Wavefunction threw down a concept: use the cube of ST for Basic Lift, and therefore power, instead of the square. I’m sure there are lots of biomechanical reasons for not doing this. But he noted a few advantages right off the bat, most notably that ST is equal to HP, and HP go as the cube root of mass, so that scaling the two together means if you have a ST 50, HP 50 giant, he will have the lift required to move his weight just like a human. More or less. Close enough for RPG purposes. It also compresses the ST scale like +Sean Punch‘s recent article about log ST does. A quick table in the PC-centric range of ST 6 through ST 20. So what this does is compress PC lifting strengths into the range of 9-16 instead of 8-20. Each point of ST means more than it used to, but at least within the realm of human-centric PCs, it’s not crazy-town. The implications on carrying capacity go way up for equivalent points in the PC range of 10+. So at CubeST 14, you’re getting maybe 7-8 points of Lifting ST as a bonus. That won’t break anything. The implications of this on damage scaling? Still interesting. At human ST scales, ST 16 is darn strong – equivalent to QuadST 20 – but now punches for 1d (thr-1) instead of 2d-1, and the off-the-damage-table swing base is 2d+2 instead of 3d+2. Alternate damage scaling? Sure. 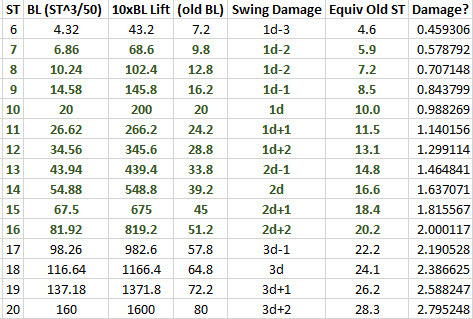 If you decide that swing should be about 1.5x thrust, that pulls ST 16 down to 2d-1 swing, or about DR 6. If you wanted thrust damage to be related to basic lift and be quadratic in intensity, so that it scales with firearms, you could do something like “points of damage is sqrt (BL) * Constant.” If you adjust so that damage at ST 16 is 2d and ST 10 is 1d, you can see that works out OK, with CubeST 20 being something like 3d-1 swing . 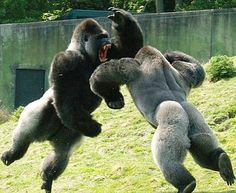 . . and that’s for someone that can lift nearly 3/4 of a ton, and clearly non-human. HP are now matched directly with mass – and that has its own value. To the point where you might be able to start doing interesting things with ST-to-HP ratio and log scores and all sorts of fun things. A reminder based on the HP–>Mass conversion is that the assumed HP of a complex, Unliving object is 4 x cube root of weight in pounds, or 2x cube root of weight for complex, living objects. Like PCs. Turning that around, and treating HP as mass only you get Mass = 1/8 x (HP cubed). I’d have to play more, but it seems that one could look at figures like “maximum physical capacity” as the ability to move yourself plus the ability to move stuff. That is, some multiple of basic lift plus you assumed mass for HP equal to ST. 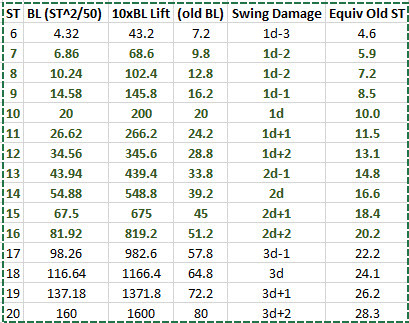 So ST 10 might have a total lift capacity of 125 lbs (the expected midpoint for HP 10 for mass) plus 15xBL (the max you can carry on your back without lifting it there yourself) for a total lift capacity of 425lbs. That includes the person. That probably motivates some funky breakpoint behavior, so I won’t charge down that road. But it would allow some very interesting calculations based on Strength-to-Weight ratio directly. Jumping vertically would be the equivalent of throwing yourself, and ST to mass-based HP ratios could be used to determine lots of physical feat results. Of course, you wouldn’t do math like that at the table. You’d look ST and HP up on the Size and Speed Range table (which is a logarithmic basis), and use the difference between the two to determine results – because log subtraction is division, so you’re doing easy ratios. I think the proposed rescale bears serious consideration for game balance and normalization purposes. 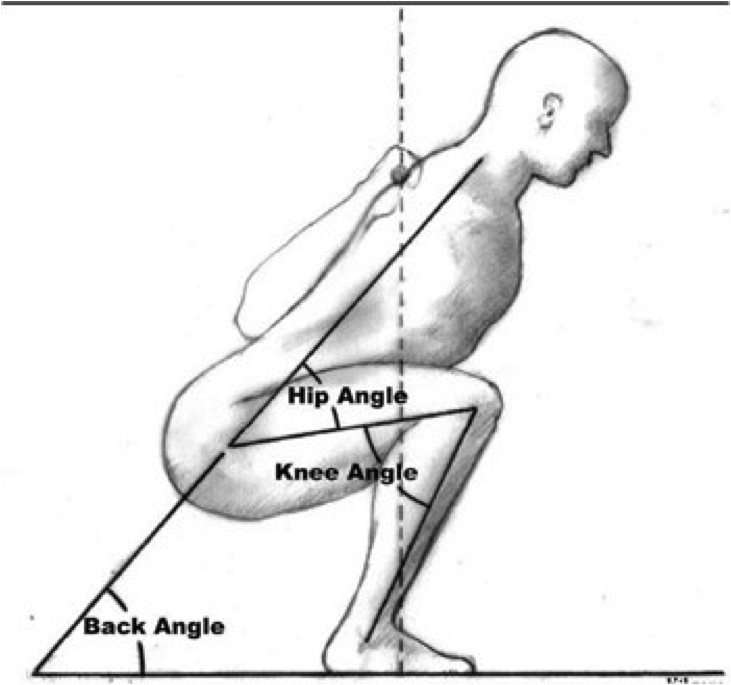 You get more “bang” in lift terms from lower ST values, and if the GM is willing to fairly rigorously enforce ST and HP bounds (your ST should be within 2 points of your mass-based HP would be a decent rule of thumb for human normals) it should work. Someone wants to buy ST 20 as a human normal? Lift 3/4 ton? Sure. You’re 18 HP, which means you weigh between 670-790 lbs. Oh. Too heavy? How about you clock in at a fit 325, Mr. Conan, for 14 HP and ST 16. Interestingly Brian Shaw, the current world's strongest man, is fairly close to the lower weight level for ST 16 at 434 lbs, although he's not the leanest of chaps. I must say, personally I don't have a problem with this progression not scaling with firearms without a bit of fiddling (though it is surprisingly little fiddling), humans, even with specially designed weaponry, probably aren't as efficient at imparting energy to a subject as a firearm or as we are at lifting things, since we're mainly designed as manipulators rather than fighters. Although that's just a guess to be honest, I really don't know enough about the biomechanics, but its a good enough excuse for me to be happy using the system as is. The scaling is still a bit too fast than what you "should" get with proper scaling with energy, but it's better, and damages are tamed a bit. The biggest benefit is what you pointed out in your original post: the right ST for a creature with 50 HP worth of mass is 50 if you want them t move like a human. Boom. Done. A bit more like Villains & Vigilantes then. Possibly – I'm not familiar with V&V.